Tuesday, November 15th 2016. Valencia. Just past four pm. Day one of the preseason. The rush to see new riders in new liveries and new bikes has died down and a hush has long fallen over the pressroom. As an exhaustive season nears its end, those seated within contemplate the final push. Two more late nights and a deserved break awaits. But from silence comes a stir, a murmuring of voices, the odd journalist nudging a nearby photographer. The odd person stands up, pointing at one of the screens above. Something must be happening. Ducati's Jorge Lorenzo has just posted the fastest first split. Not bad. But there is an audible intake of breath - with the odd cheer thrown in - as the second turns red, confirming his speed through that four-bend stretch. Soon everyone in the room has pulled themselves away from their word documents, their twitter feeds. Now Lorenzo has the room's attention. From the first lap that morning, the five-time champ appeared at ease on the all-black Duke. His lean angle was no different to that of two days before. Transitioning body from left to centre to right and back again was all done with the minimum of fuss. Exiting turn eleven the third split flashed red. A cheer goes up. Some jump to their feet, clapping, shouting him on. Vamos! Sure, testing counts for nothing but this is remarkable. From a library-like silence, the pressroom is soon a bubble of activity and raised voices. 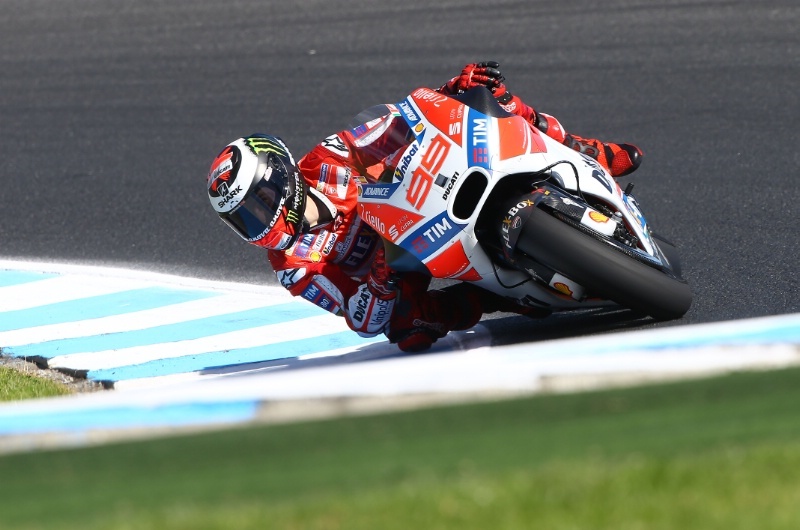 Even though he loses just over a tenth in the long final left and run to the line, Lorenzo's lap is still good enough for third, a position he maintains until the end of that day. Colleagues nod their approval at one another. The Majorcan has surprised many of us. This is, after all, only day one of this new adventure. At that moment all seemed well. There was the shared laughter with Ducati test rider Casey Stoner that morning. There was the defiance, with Israeli TV's Tammy Gorrali reporting Lorenzo said to her, 'See! Told you I could be fast on another bike!' There were enthused comments from those in his team. "We have a fantastic professional rider that works in a very professional way," said Davide Tardozzi. And, most importantly, there was the speed. But things in life are rarely as simple. Especially for a rider who has spent each and every one of his 156 MotoGP weekends atop a machine vastly different from this one. And especially for a factory that is still attempting to gain a footing at the very elite level of this class. After all, Ducati not featured in the running for a rider's title since September 2008. Since then it hasn't always been as rosy. Contorted expressions, whispers of raised voices behind closed doors and some less-than-inspiring times (17th after the first day of testing at Sepang was as rude an awakening if ever there was one) chief among them. That's not to say this hasn't been a winter of promise. In spite of losing its winglets, the 2017 Ducati has retained the strengths of its predecessor. That and the sense there has been a level of steady improvement on Lorenzo's part, that upward trajectory when plotted on a graph marking speed over time that riders find so vital to maintaining momentum and confidence. At each test Andrea Dovizioso and, to a lesser extent, his new team-mate have been competitive, toward the front. As Dovizioso said at the Phillip Island test, the '17 Ducati is a definite upgrade on what went before. However, the new machine hasn't solved that major weakness of the past - mid-corner turning, a feature that became depressingly apparent in Australia. Few doubt this bike's ability to win races. But will it be good enough to challenge for the world title? With Marc Marquez and Maverick Vi?ales in this kind of form, that very much remains to be seen. Take Jerez, Catalunya, Misano and Aragon out of the equation, and it could be argued that at least one of Ducati's riders was in the podium hunt at each track. But at this level, with this competition, that isn't enough. Not to worry. Technical chief Gigi Dall'Igna was all-too-aware of this, and the 2016 machine's defects. Dovizioso has placed inside the top four at each test bar Australia. He still doesn't think it will be enough for a Ducati title charge. pic: Gold&Goose. "I think our main problem is the turning of the bike in the middle of the corner," he said after 2016's final race. "For sure we have to improve the chassis in that area, and we have some ideas [to better this]." This may not lost a rider so much time over one lap. But over a race distance that increased effort adds up. Dall'Igna had promised chassis improvements. And no doubting, the new machine brought about small gains. But it hasn't been enough. 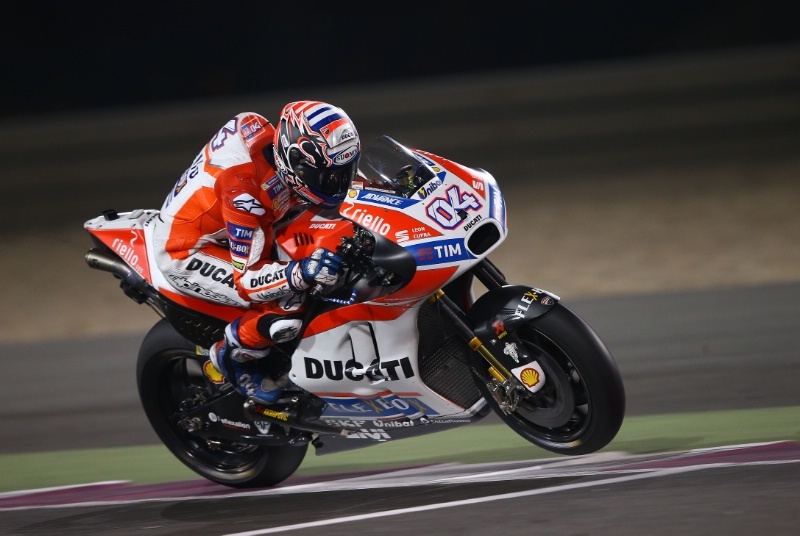 "After Gigi's fix [turning] is not a great problem, but still the bike is too hard to ride when you have to do a full race distance," said Dovizioso in Qatar. "We can be fast but it is difficult to manage all the movement." Asked whether he was prepared to accept the Ducati's difficulties, the Italian quipped, "It's been four years [with this problem] so I already accept it!" The long, fast corners of Phillip Island, in particular, shone a light on these issues. The new bike has maintained the outright speed and heavy braking potential of old and in Dovizioso, Ducati has a rider ready-made to take full advantage of these strengths. For Lorenzo, it's still a work in progress. To learn the reactions and characteristics of a new machine is one thing. Slotting into, and making oneself comfortable with the workings of a new garage is quite another. In four months, Lorenzo has had to factor in Ducati's working methods to his already hefty 'Objectives' list. Having built up a clear understanding with Ramon Forcada over nine years, Lorenzo is building up his professional relationship with new crew chief Cristan Gabarrini. Just one member of his Yamaha crew - Juan Llans? - has moved across, meaning there were many bonds to forge. Factor in how explaining a machine's behaviour may be interpreted one way by Yamaha engineers, and another by those in Ducati apparel, and you realise this was never going to be a seamless transition. Not always known for his patience in the garage, by some accounts, this learning process hasn't always been the smoothest. After Valencia, Lorenzo has not been as fast as he would have liked. Still, he has improved steadily. pic: Gold&Goose. Working methods, body language, choosing words, each with its own specific meanings, and often speaking in Italian - Lorenzo has needed each and every one of his eleven days of testing to get where he is. However, getting the 30-year old up to speed remains Ducati's focus. To put it bluntly, they can't afford him to fail. And after the past year, when he was sure his team-mate was receiving preferential treatment, this will spur Lorenzo on. The possibility of winning in red - something Valentino Rossi never did - is surely the carrot that dangles before him. Then there is adapting his own inimitable riding style to the Ducati's needs. To his credit, there has largely been an upward trajectory to Lorenzo's testing performances. In Malaysia and Australia he was slow on day one. But by the end, he had improved, taking nearly all of the three days to understand how each corner of the track should be attacked. Braking deeper and squaring the corner off more was key. "Let's say that the slow corners, the hairpins, you need to ride very different," he said at Sepang. "The faster corners, a little bit different but you can still carry a lot of corner speed." At the team launch he spelt out his aims: "Our obsession must be improving our package day-by-day and week-by-week." That he was fast from the off at Qatar boded well. At certain tracks, the package is already very strong indeed. Much has been made of the '17 machine's 'salad box' and reshaped exhaust but working to limit the absence of winglets has been a focus point. Stoner, who so stunningly topped the time sheets on day one at Sepang, spoke of the differences between the '16 and '17 spec bikes. "No wings is the biggest difference. There's a little bit more wheelie-ing, a little more instability at high speeds. It's just a different character in the way the bike wants to ride mid-turn." 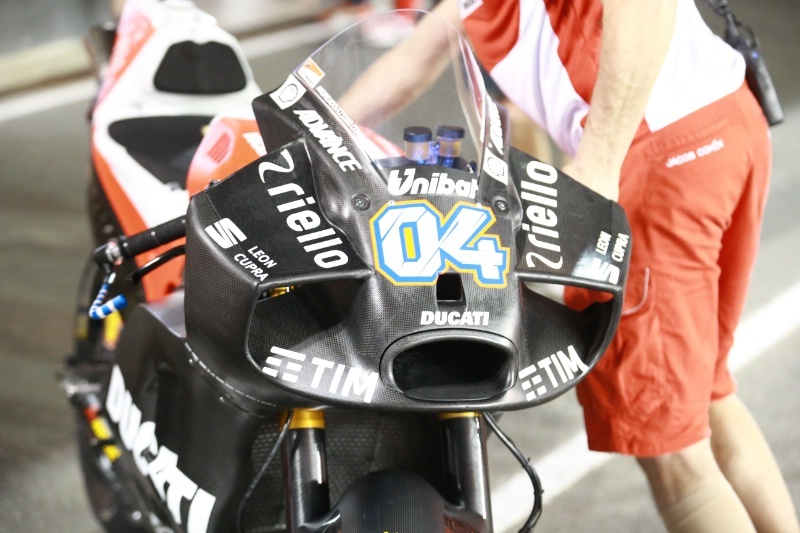 Ducati's radical 'hammerhead' fairing, debuted at the final test in Qatar. pic: Gold&Goose. Enter stage right the 'Hammerhead' fairing, debuted on night two in Qatar. According to Dovizioso, it is "very close" to replicating downforce provided by winglets. "It's not the same, but very close." This could be another factor that works in the riders' favour. There is also a third GP17 on the grid to be considered. Pramac Ducati's Danilo Petrucci is there to sample new parts, different set-ups and tyres, and there's no reason to believe the marque can't match its performances from a year ago, at the very least. Dovizioso's speed at Sepang and Qatar contrasted to his difference to the leaders in Australia, suggesting Ducati will once again shine at some circuits, struggle at others. Whether that is enough to justify the lavish spending on Lorenzo's salary - a reported twelve million Euros per year - is another matter. Nonetheless, Ducati finds itself in its strongest shape in Dall'Igna's three-and-a-bit year tenure. An exciting campaign awaits.